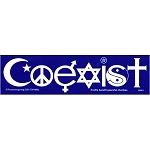 Peacemonger s full color mini stickers are made in America. All of our mini stickers are printed on durable high quality vinyl. Peacemonger s full color mini stickers are durable and will last for years to come. All Peacemonger items come with an unconditional, 100% satisfaction guarantee. You may order any of our full color mini stickers pre-applied to a clear static cling material for an extra charge. This will make the sticker dynamic. You ll be able to place it on your fridge, then move it to your car window if you choose. If you would like information on a specific product, please email Customerservice@peacemonger.org.